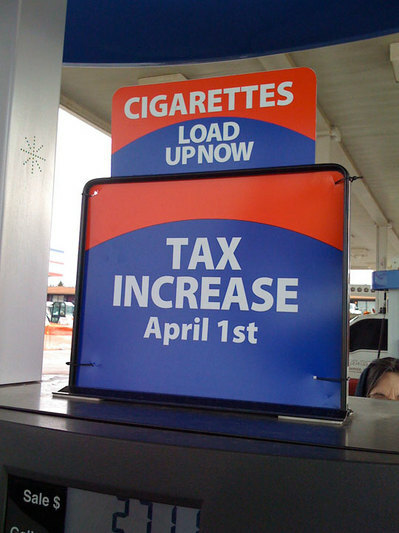 I’m glad that Thorntons is looking out for us by reminding us to load up on cigarettes. Who’s the comedian here? Kudos for Jon Stewart for calling these clowns out. But, really if you’re getting your stock picks from Jim Cramer, you probably shouldn’t have been in the market in the first place. 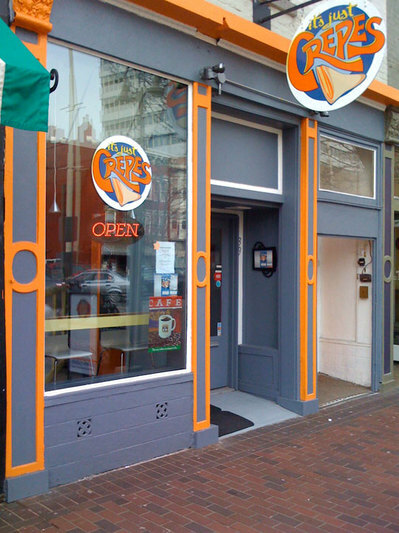 I went to It’s Just Crepes on Court Street here in Cincinnati on Saturday. I’ve been meaning to go for a while and this weekend’s beautiful weather provided the perfect opportunity to enjoy one of their crepes outside. They serve both savory breakfast crepes and sweet ones. 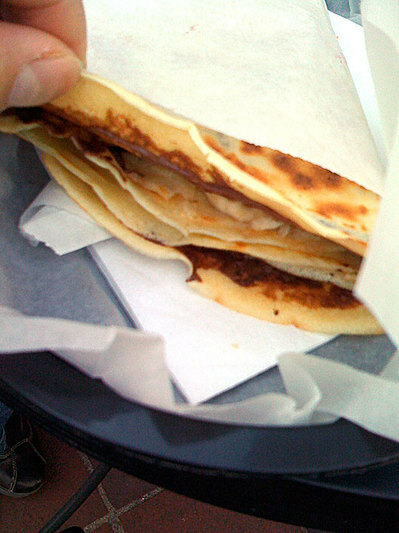 The savory crepes sound good, but it’s hard to resist the dessert like qualities of a sweet crepe! 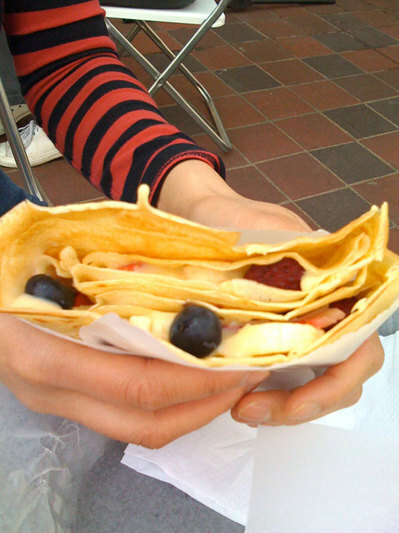 I had a Nutella and Banana crepe while my sister had a “It’s Just Fruit” crepe with mixed fresh fruit. Here are the crepes being made. 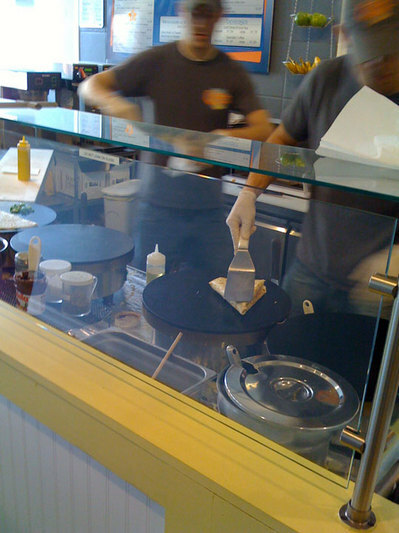 The staff was very helpful in suggesting crepes to try out. 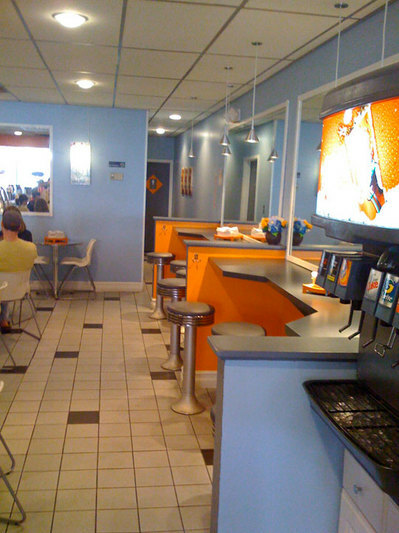 The interior is simple and clean with some table and counter seating. There are more tables on the left outside of the picture, but people were sitting there and I didn’t want to intrude on their privacy by taking a picture of them and putting them on the blog. We sat outside at one of the three cafe tables that face Court Street. The “It’s Just Fruit” crepe. We got two different crepes with the intention to share, but the crepes are folded into a triangle and wrapped in paper for non-silverware eating. I’ll just have to keep going back to try out the different crepes. I highly recommend It’s Just Crepes. And it’s now open Sunday mornings. It’s great to have more weekend downtown breakfast options! So, for example, he told the President that if he was rooting for the visitors, he was “gonna have to keep it to a low roar, because we’re cheering for the Wizards over here.” Obama, in turn, repeatedly needled Rawls about the Wizards’ habit of letting leads evaporate, especially when the Bulls made a run. President Obama being a sports fan is one of the things that makes him more personable and approachable than any other President. But, he’s still the President and there’s a fine line between what is acceptable behavior and what is not. I’m a big sports fan too, but I find a constant chatter of trash talking to be pretty annoying, no matter how humorous it may be. Some people don’t realize that there are fans that go to be entertained by the game and not by some idiot’s commentary. In November, the developers started coming up with other possible names. The choices are: Riverfront District; Park District; Parkside; The Banks. I like “Riverfront” or “the Riverfront”, without District. Just plain Riverfront. As old reminder to Riverfront Stadium. Second choice would be The Banks. I think it’s better to have something related to the river. That’s why Park District and Parkside just don’t work fo me. 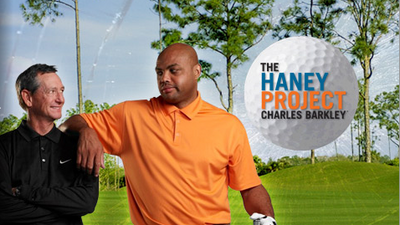 I recently watched the Golf Channel’s new reality show- The Haney Project: Charles Barkley. In this series, Hank Haney, Tiger Woods’s swing coach attempts to fix the horrifically bad golf swing of Charles Barkley. The first episode where Hank Haney is introduced to Charles Barkley was one of the funnier things that I’ve seen on TV. Charles Barkley is his typical class clown self, but serious in trying to work out his swing. Hank Haney is a serious instructor, but more than held his own with his own sense of humor. Between clips of bad Barkley golf shots, an imitation of Barkley’s swing by Tiger Woods, and non-stop banter, you have a pretty entertaining show. The show is scheduled for 7 episodes, so we’ll get to see how Barkley progresses. One thing I got out of watching this is even more admiration for Tiger Woods. Hank Haney asks Barkley if he’s like to do a Tiger Day. A Tiger Day is pretty much 12 hours of golf, hitting balls, and working out. Tiger’s extremely talented, but his hard work ethic and discipline is what separates him from everyone else. 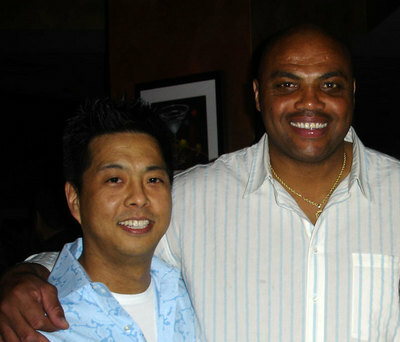 Charles Barkley was in Cincinnati last month for a show at the Cincinnati Convention Center and I ran into him at salsa night at Havana Martini. As a personality/celebrity, he’s pretty approachable and quite friendly. Maybe it’s a little character rehabilitation for all the troubles he’s recently created for himself. 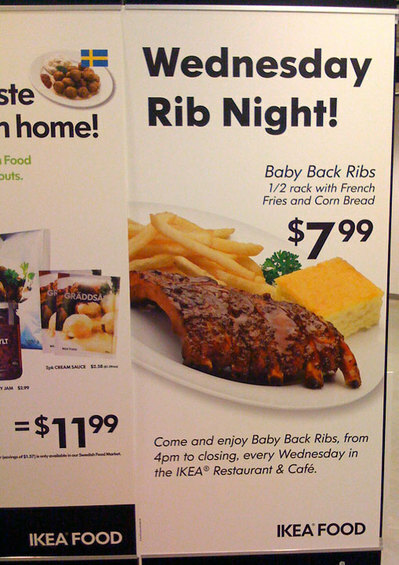 Wednesday Rib Night at Ikea! I saw this sign the last time I was in Ikea. Today’s Wednesday. Might stop by to try this out. As a side note, my office is 5 minutes away from Ikea so it’s really convenient for me to stop by after work and eat or grab a quick item. If you want to avoid the weekend crowds, try going after work during the week, there are no lines at all. General Mills is using some retro packaging for some of its cereal products. Retro Trix is really cool. 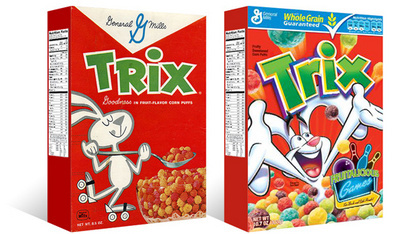 Modern Day Trix scares me. It’s like a poster for attention deficit disorder fueled by high fructose corn syrup. Check out the article for pictures of the other retro cereal brands. An interesting article on filibusters and their history. Did you know that Senators were elected by the state legislatures and not by the people before the 17th Amendment in 1913? Back then, the Senators were representatives of the interests of the State in which they were from.